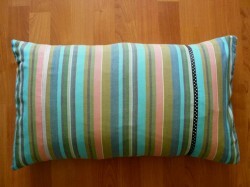 Decorative pillows in bright colours. Size 40 x 60 cm. The frontside is the original kikoystof, 100% cotton. At the left and the right side of the front you see shining straps, stitched there to give the pillow an extra appearance. 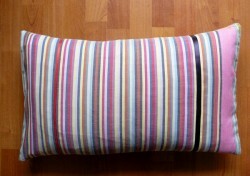 The back is made of solid linen cotton. 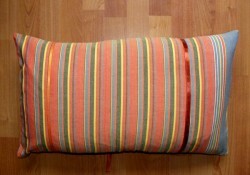 The overlap-closure at the backside is done by satin or cotton straps. The natural materials give your home and garden a warm and natural atmosphere. 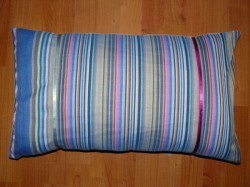 When you order this product you get the pillow cover including the pillow.You can as well order only the pillow cover. 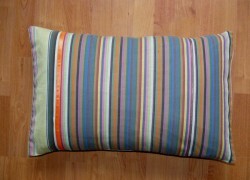 The pillow covers are made in our workshop in Nairobi. Two ladies have made again a beautiful additional Kikoy product. They do this with pleasure and they are very happy with the money they earn with this work. As with all other products which you buy at the KikoyShop, the profit will directly benefit our projects in Kenya. Currently we are in the middle of the process of drilling a borehole in Ngu Nyumu, a village of 700 inhabitants, an hour’s drive east of Nairobi.